One of the world's most important medicinal plants, garlic is also one of the most researched, with over 1,000 published papers investigating its therapeutic activity. Garlic is believed to have originated in southwest Siberia, but spread to much of Europe and Asia in ancient times. It has been used as a medicinal herb for at least 5,000 years, and is now known to reduce the risk of further heart attacks, as well as lower blood cholesterol levels. Garlic helps in the digestion of fats by increasing secretion of bile. The herb deeply affects the blood and circulation, demonstrating fibrolinic (blood-thinning), antitumor and anti-blood-cholesterol activity. Being a strong antibiotic, the raw cloves, garlic oil, and tincture contain thiosulfinate compounds that exhibit marked anti-bacterial effect, and is used to treat colds, catarrh, and respiratory infections. Take up to 1 tsp (5ml) of juice in honey or water twice a day to combat infections, arteriosclerosis, or to reduce the risk of thrombosis. Rub the cut side of a fresh clove on acne pustules at night. Eat 2–3 cloves in cooked food each day to improve the cardiovascular system, lower cholesterol, or help prevent colds and flu. Avoid high dosages of raw garlic as it may cause gastric irritation. Take 1 capsule before meals (check dosage on the package) to help prevent seasonal infections. Take 40–80 drops (2–4ml) in water 3 times daily for cardiovascular problems, respiratory disorders, or fungal infections. High dosages of raw garlic or tincture might cause gastrointestinal disturbance, nausea and sometimes vomiting. Administering garlic tincture in milk instead of water will provide an emollient effect that generally prevents side effects. For anyone who has suffered a heart attack, take up to 1 level teaspoon each day stirred into water or fruit juice to help prevent further attacks. To make garlic oil, crush or finely chop 4 large cloves and place them in a small non-stick pan. Add 3 tablespoons of organic olive oil. Heat gently until the mixture is just simmering then simmer for 1–2 minutes, stirring constantly. Pour the contents into a glass jar and leave to cool. Strain, bottle, and label. Use within 12 months. Use as a dressing for salads or other meals. Crush 6 cloves of garlic, remove the skins, then put them into 1 cup (240ml) of goat's milk in a saucepan and simmer until garlic is tender. Add 1 tbs (15ml) of honey and take the thick liquid freely for the nutritive, immune-enhancing, antibiotic, expectorant and cough-suppressing effects. It is also possible to eat the barely cooked garlic if desired. A simple and effective kitchen remedy for colds, sore throats, and coughs can be readily made by mixing a crushed clove of garlic with freshly squeezed lemon juice (Citrus limon), 1–2 tsp (5-10ml) of honey, and a pinch of dried ginger (Zingiber officinalis) powder or, preferably, a small piece of chopped fresh ginger root. Place in a mug, add hot water, and stir. Drink up to three cups a day. Garlic may be taken alongside, and is likely to complement, prescribed antibiotics, at the same time warding off possible side effects by helping to protect beneficial intestinal bacteria and reducing the chances of developing thrush. Prefers a warm site in deep, fertile, well-drained soil in full sun. Plant bulbs or individual cloves 2–4in (5–10cm) deep in the soil in autumn or winter. 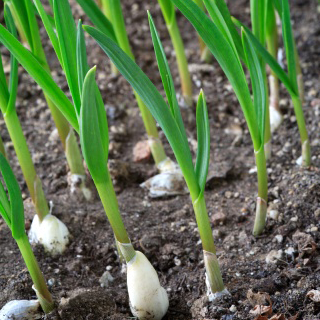 Gather the bulbs in late summer and early autumn and air-dry before storing in frost-free conditions.